This Valentine’s Day, February 14th, La Cheminée – Pullman Hanoi offers a ‘Sharing Romantic’ 5-course menu, designed exclusively couples. Diners will indeed get to be amused by the Western cuisine, bringing them along with the tasteful set from the savouries to the sweetness. A charming atmosphere, romantic decoration with shimmering lights under the candles and roses as well as a surprise gift for you will surely give an unforgettable memory. The set menu will begin with roasted tomato soup served with crispy Parma ham and rolled Parmesan cheese to the fresh flavor from Chef’s recommended salmon tartare, then be inspired by the grilled American T-bone dish; then end up with Chocolate lava cake with fresh strawberries and ice cream. The full menu is including roasted tomatoes soup (served with crispy Parma ham and rolled parmesan cheese topping), Chef’s recommended salmon tartare for appertizers; Pan-seared seamed tuna fillet with green salad; Grilled American T-bone for sharing main course (served with mixed green salad, baked herb potato and choice sauces of creamy mushroom, green peppercorn or red wine); and Chocolate lava cake with fresh strawberries and ice cream for dessert. Price is at VND2,300,000 net/ menu (for two persons). 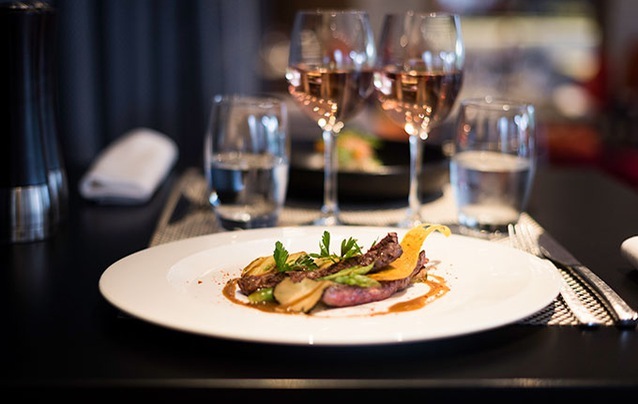 Diners can upgrade their menus with one bottle of Prosecco, one bottle of Perrier (75ml) and one bottle of Evian (75ml) at VND3,300,000 net/menu. Price is inclusive of a 5% service charge and 10% VAT. Located next to Dam Vac Lake, the center of the Nam Vinh Yen new urban area, and nearby the administrative center of Vinh Phuc province, DIC Star Hotels and Resorts Vinh Phuc is the first five-star hotel in the city of Vinh Yen.